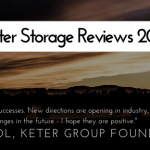 We recently reviewed the factors that help make The Keter Store It Out MIDI and The Keter Store It Out Max skyrocket into the global market. And now, the time has come to review the biggest member amongst Keter’s Store It Out family, the Keter Store It Out Ultra. There’s so much space in the Keter Store It Out Ultra that you could easily store 4 bicycles (2 adult’s and two children’s) inside of it! 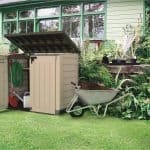 Considering it’s the largest storage unit offered by Keter, this garden storage could be perfect if you are looking to store more than just your garden tools and lawnmowers. Want to ensure your BBQ is clean and ready for your next party? The [amazon link=”B00I01O6YW” title=”The Keter Store It Out Ultra” /] could make this a possibility. This is as it can easily prevent large outdoor items from being exposed to dirt and rust. The impressive 2,000 Litre capacity could be the perfect home for your outdoor furniture, mowers, and other large garden equipment. Keter is a company well known for producing garden furniture and storage units made of a heavy-duty plastic material called resin. They have a variety of products to choose from and they could be a nice addition to your household. 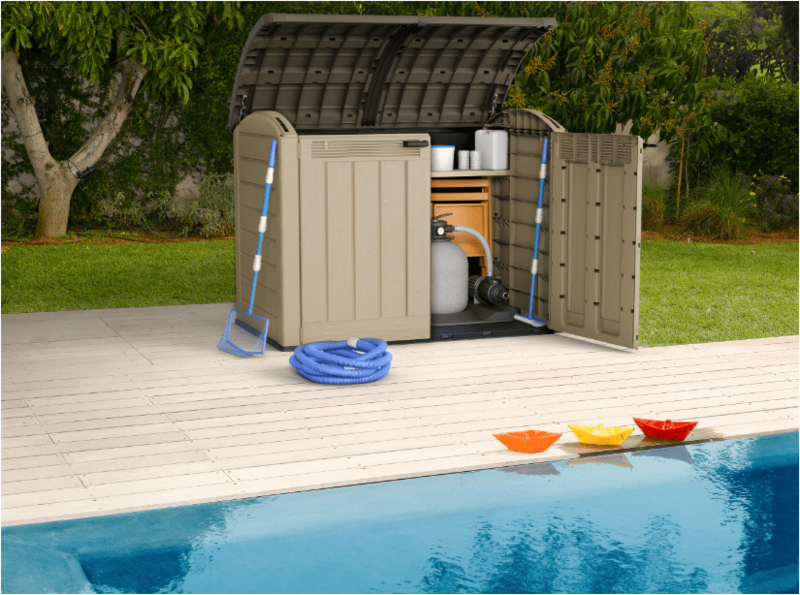 The Keter Store It Out Ultra isn’t your typical large plastic outdoor storage. Aside from the fact that it doesn’t require any maintenance, it’s also weatherproof and rustproof. Plus, the design contributes to the aesthetics of your garden as they cleverly mimic the appearance of wooden sheds. However, if you think this storage might be too big for you, check out smaller variants such as the Keter Store It Out Max and the Keter Store It Out Midi. The Keter Store It Out Ultra is made of a thick plastic material called resin. Even though plastic is known to be fragile, a resin is a material known to be hard as wood meaning it is likely to last for a long time. So no need to worry about hitting it with your bicycle because as it has wide doors and an easy opening lid that won’t get in your way. The store is unlikely to form rust and there are no holes for the water to make their way inside. The floor is also made of a heavy duty material to prevent anything from leaking making it able to withstand weather any conditions with little amounts of maintenance required. From one quick glance, who would realise that these Keter products are made of plastic? They are made to look like wooden storages and we’re loving it! The elegant wood-effect panels on this product help make it look very appealing. The Keter Store It Out Ultra is in brown and beige tones that can blend naturally with the green grass in your garden. The neutral colours won’t be a distraction to you or your visitors. The Keter Store It Out Ultra offers an XXL storage area for your outdoor items such as barbecues, mowers, bicycles, furniture and wheelie bins. It can hold up to 2000 Litres which results in plenty of space. 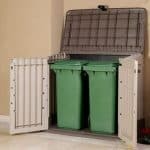 If you want to keep your garbage bins out of sight, you can put up to a maximum of two 320 L wheelie bins inside this large storage unit. Storing heavy equipment and large items won’t be an issue with this garden shed because of its hydraulic-piston assisted lid and wide-opening front doors. It also has a sloped threshold that makes it easier to transport heavy items in and out of the Keter Store It Out Ultra. The Keter Store It Out may be an XXL size but it’s still surprisingly lightweight as it’s made of plastic. This makes it easy to assemble on your own, even if you’re not a handyman (or woman). It has internal metal reinforcements to help keep all the parts together. Unlike wooden and metal sheds, plastic sheds just require a little bit of washing from time to time. Other than that, there’s no necessary treatment needed to prevent it from wearing out. No matter how hard the rain is or how hot the sun is, your items inside are safe and sound. Just make sure to not put it under direct sunlight in order to maintain the quality of the plastic material. Some reviewers recommend using long padlocks to add security and to keep the lid in place in case of strong winds. With this product, you will never have to worry about the lid being lifted off by strong winds. Not only that, it’s also made of a durable plastic material that’s weatherproof and fade proof. 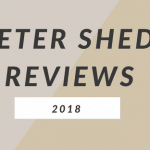 The Keter Manor Outdoor Plastic Garden Storage Shed is 6 x 5 feet making it large enough to fit a person, meaning it can be double up as a small workspace. It has ventilation ducts for air circulation if you plan to use it for building projects or anything similar. If you’re in doubt about having a plastic storage unit hanging in your garden, this large wooden storage might be something you want to consider. The BillyOh 6×3 Overlap Wooden Pent Bike Storage is not only perfect for storing bicycles. You can also keep your garden tools, lawnmowers and other equipment in order to keep your garden neat and tidy. It’s built with 7mm overlap boards to ensure your belongings are dry whilst standing still amidst extreme weather conditions. It also has a solid sheet roof and black sand felt for added protection. However, keep in mind that wooden sheds require maintenance over time to keep them in good shape. To give you more options other than wood and plastic sheds, here’s one that’s made of steel. The Lotus by Globel 6 x 3ft Pent Slate Shed is made from high tensile, hot-dipped galvanised steel. It’s a large metal shed that can be used as storage for your garden tools, mowers, furniture and other outdoor belongings. It comes with a 15 Year Warranty in case anything goes wrong. It also claims to be rust-free and durable so it’s safe to keep your most valuable items inside. If you’re looking for an extra large garden storage to store your valuable belongings, [amazon link=”B00I01O6YW” title=”The Keter Store It Out Ultra” /] is something you might want to consider. It’s a very useful place to keep things in one place and not have them scattered around your garden. I only needed to keep a few bits of clutter out of sight so I decided to buy the Keter Store It Out Max for myself. If you have a large number of outdoor items to hide and keep dry in any weather, this storage is a good investment that will surely last for a long time. Plus, if you’re the type of person who doesn’t like to tinker, the Keter Store It Out Ultra won’t cause you any stress because it requires zero maintenance. It could last a long time with just a simple wiping and washing once in a while. 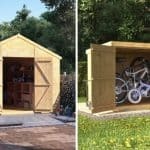 Do you need storage simply for your garden tools or are you in need of one to keep your bikes dry and safe? It all depends on what you intend to do with your storage. Small garden sheds are mainly for garden tools and toys. If you just want extra storage for some clutter, you can stick with a small one. While bigger garden sheds are ideal if you need to keep larger equipment out of sight. Lawnmowers, barbecue, bikes and furniture can be kept in big sheds to keep them dry and secure. It’s also important to consider the available space you have in your garden. Make sure you have some space to walk around the shed so you can clean and maintain all the sides when needed. Which material should I buy? Wooden sheds can add beauty to your garden but they can require a lot of maintenance. Wood tends to wear out easily and it needs to be treated from time to time. Whilst plastic sheds are weatherproof and maintenance free, they are more fragile than other materials. They are also not that secure so it’s recommended not to store valuable items inside. Metal sheds are low-maintenance as they usually come with a protective coating to keep rust from building up. However, as it gets older, it would be quite hard to fix them by yourself. Metal sheds are also less likely to withstand strong winds and extreme weather conditions. What style should my shed be? There are a variety of shed styles available on the market. You can find a wide array of selections from vintage to modern designs. Imagine how it would look in your garden before buying it. If possible, take a picture of your garden and use it as inspiration when choosing the right garden shed for you.